Billiard Cloth or Digitally Printed Layouts (Standard or Customized). We Carry Blackjack Layouts, Craps Layouts, Roulette Layouts, Baccarat Layouts, Poker Layouts, Over/Under Layouts, Pai Gow Layouts, Chuck-a-Luck Layouts, & Custom Cut Billiard Cloth (by the yard)! Custom Printed Casino Table Game Layouts with your logo/design are also available. Our casino quality blackjack layouts are made on billiard cloth. You can choose from Standard Blackjack Layouts, Hit Soft 17 Blackjack Layouts, and Oversized Blackjack Layouts. 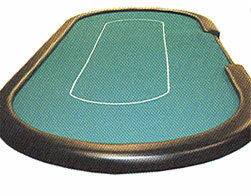 Casino quality blackjack layouts are in stock for immediate shipment. Our casino quality baccarat layouts are made on billiard cloth. You can choose from our Mini, 7-Player, Layout and our 9-Player Layout. Casino quality baccarat layouts are in stock for immediate shipment. We also carry casino quality, Chuck-a-Luck Layouts, Craps Layouts, Over/Under Layouts, and Pai Gow Layouts (Chinese Dominoes Layouts). All of our professional quality layouts are made of billiard cloth. They are in stock for immediate shipment. These Poker Layouts are made from casino quality billiard cloth/Mali. Our layouts are in stock for immediate shipment. Inner printed oval measures 58" x 18". The following casino quality/billiard cloth layouts are also available for immediate shipment: Stud Poker Layouts, Chuck-a-Luck Layouts, Craps Layouts, Over/Under Layouts, Pai Gow Layouts (Chinese Dominoes Layouts), and Pai Gow Poker Layouts. Now $83.28. Was $119.50. Save 30%! Our Home-Style Layouts are made of high quality 2-millimeter thick felt. You can choose from the following Casino Layouts: Blackjack Layouts, Mini-Baccarat Layouts, Craps Layouts, Pai Gow Poker Layouts, Poker Layouts, and Roulette Layouts. Each of our Felt Layouts measures 3' x 6'. All Home Style Layouts are in stock for fast shipment.